Veggie 101: Avocado Pico de Gallo "Cocktail"
Avocado Pico de Gallo "Cocktail"
If you like salsa, this dish is for you. If you like guacamole, this dish is for you. And if you like salads, this dish is also for you. This quick and simple recipe is an interesting combination of the three, so of course that means it's super versatile. Whether you eat it with chips, atop any Mexican dish, or even as a small side, it's so delicious that one serving definitely won't be enough. Let's say you buy a bunch of ingredients to make fresh guacamole, but then you add in some diced hearts of palm: well, that's pretty much what this "cocktail" consists of. 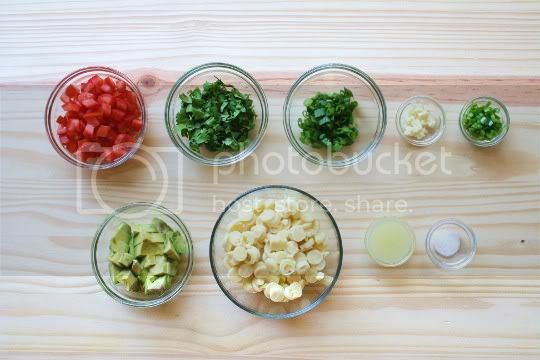 And if you don't like hearts of palm, hey, you can still make a delicious salsa! 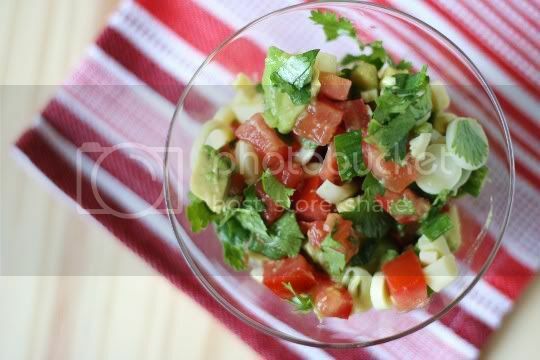 Simply combine diced tomatoes, cilantro, green onions, hearts of palm, and diced jalapeno. Then carefully fold in diced avocado (and I suppose you could double the amount and mash it for a guacamole), and toss everything with lime juice and salt. So easy! It's like eating a salsa-guac hybrid, with the hearts of palm giving it a briny, tart flavor. There's a high ratio of cilantro in here, but that's a great thing if you like that pungent citrusy flavor. The avocado adds a buttery creaminess, which is a great contrast to the firm and juicy tomatoes. The mixture is perfectly seasoned and tangy, and it's a light and fresh dish that's wonderful alongside something starchy. I ate mine both by itself and also with chips, and I was amazed at how well it kept after a couple days. That's right, the avocado (most of it anyway) didn't turn color and develop that weird rancid taste as it usually does. Maybe the hearts of palm added extra acidity or something. Anyway, there probably won't be much left next time, as I could definitely eat this all in one sitting! Make again? Yes. 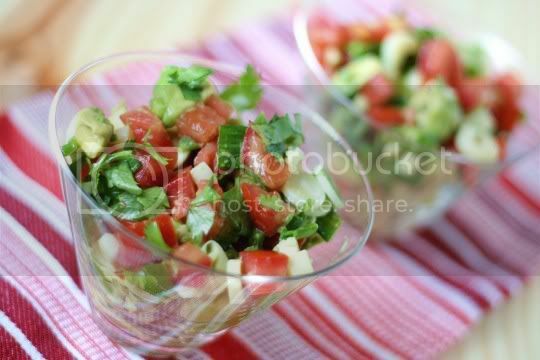 A nice twist to salsa and/or guacamole that will keep people coming back for more.